Curious, right? Fortunately, our friend Phil over at Angry Asian Man did a bit of debunking homework, digging up the most likely source for the popular search: an article entitled “I Am Extremely Terrified of Chinese People” on the satirical site Christwire. 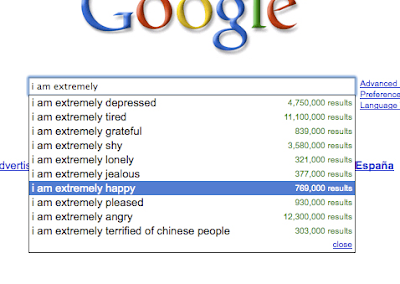 Still, before I knew about the article, I wondered, are Chinese people actually so scary? Moreover, could I possibly be scared of Chinese people? Well, I told myself, Jen is the Chinese person I know best. But despite her sharp tongue and freaky-brilliant mind, she’s the most fun, kind, genuine, warm, generous, honest, caring person I know. What’s so terrifying about that? I can’t possibly fear Chinese people! Jen also has–and I’m sure I’ve talked about this before–one of the most exquisite closets I’ve ever walked into, and she is eager to loan me a frock faster than a person can check out a library book (See? Very not-scary). She never asks for anything in return, and I always watch over the dresses as if they were my own child. OH GOD. I. WOULD BE. SO INCREDIBLY TERRIFIED. OF ONE. VERY SPECIFIC. CHINESE PERSON. AND HER. VERY ANGRY. ANGRY. EYES. So yeah, um, I guess it’s possible.